My last "official" weigh-in was Thursday, so it was actually the day after I started Simply Filling, and I was 142.5. So today, at 140 even, I am down 2.5 pounds from 6 days ago. I'm very happy with that! I was a little nervous about using all of my weekly and activity PointsPlus (on top of all of the Simply Filling foods), but I know that if I want to be successful with this plan, then I need to make it work for me. Using those PointsPlus on foods that I really wanted, but weren't SF-friendly, made it much easier to stick to the plan. The hardest part was coming up with snack ideas, especially for the afternoon. At night, I've been eating popcorn, but afternoon snacks are tough. I had to think outside the box of what I normally ate, and had oatmeal or cottage cheese with peaches. I missed having a Clif Bar, though! Today, I made some of those banana oatmeal cookies to have in the afternoon; those are Simply Filling (without any add-ins), and they're similar to a bar. Perfect with a cup of tea! I started a 30-day challenge today. A few weeks ago, I was contacted by a woman named Justine, who works with a firm that does marketing for certain brands. She asked me if I'd like to do a 30-day Wii Fit U challenge with some other bloggers. I love the Wii Fit, and this was right around the time I was thinking of starting strength training, so it was perfect timing. The only video games I use are Wii Fit Plus and Wii Active, so I didn't really know what the difference was between Wii Fit and Wii Fit U. I thought that the Wii U was a game or plug-in for the Wii, but it turns out that it's a new console (as explained to me by my 9-year old, hahaha). After a chat on Skype (my first time using Skype--I know, I'm very technologically advanced), Justine sent me the stuff I'd need for the challenge: the console and two Fit Meters. I was really excited to use the Fit Meter! It clips to your waistband and tracks your movement (similar to the Weight Watchers ActiveLink). It tracks distance, altitude, and intensity. 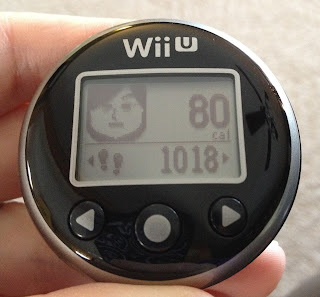 Then you sync it with the Wii Fit U game, and you can see on a map how far you've walked/run. I chose to follow the Chicago route first, so it shows a map of the Chicago running route, and then your Mii moves along the map to show the distance you've gone. It adds to your distance each time you sync the Fit Meter. Jerry and I have been having a little friendly competition to see who can finish the routes first. I thought, being a runner, that I would beat him quickly; but Jerry gets in a LOT of walking at work, so we've been neck and neck whole way. The vertical one is going to take a LONG time for me, because we don't have stairs at our house, and everywhere I run is totally flat. So I'll be on the lookout for anywhere that I can add a little bit of a climb. Justine asked me what my goals were, and I said that I wanted to start a strength training program to help me stay injury-free while running, and help me get stronger/faster. 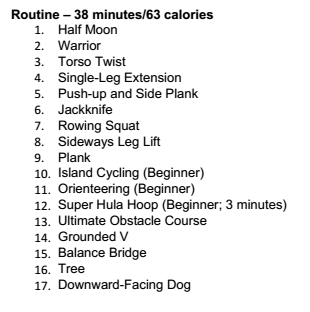 I was surprised that they wrote out a personalized workout for me! I have to admit, in the entire time I've used the Wii Fit Plus, I've never done the yoga or strength training stuff... I only use the games. But today, I did this routine on the Wii Fit U. It didn't take long, and I didn't get bored with it, because each exercise goes pretty quickly. I certainly wasn't expecting it to be as hard as it was! My muscles were really shaky by the end, especially from the yoga. I think I'm going to like this! So anyway, for the next 30 days, I'm going to be tracking my distance walked/run, and my altitude climbed for this challenge. I'm also committing to doing the strength routine at least twice a week. Ideally, I would do it three times, but I don't want to commit to that. My main goal is to make strength training a habit, so I'm starting small. I noted all my starting scores for the exercises I did, so I'm hoping to improve them at the end of the challenge! I got a call from the post office today about the PO Box I just rented. She said that they made a mistake, and gave me one of the small boxes, when I paid for a larger box. She told me that the number should be 405, not 194. I panicked. I've had the address up since Saturday, and lots of people have sent cards to Mark! She said that there were several cards that arrived today, which is when they noticed the mistake. She said it was no problem, that they would just forward the cards from that box to the new one, but that I should make sure to change the address on anything else from here on out. I'm going to go pick up the mail tomorrow, and I'm hoping that I'll be well enough to go visit Mark by Friday, so I can bring the cards to him then! I don't have a Wii U, but that tracker might be enough of a push for me to check one out! Great idea! oh that wii fit U thing looks fun. i actualy got a wii u for xmas (my husband gave it to me early) and saw that wii pedometer (or whatever they call it) for less than 20 bucks. but i knew nothing about it. ill have to check it out. Great job on the loss!! The Wii U looks very interesting. My husband and I sold our Wii because we never used it anymore so I don't know if I could justify getting a Wii U but it does look really cool! The Wii U looks fun! I haven't really heard much about it, though. Off to google, I guess! I decided to do the Simply Filling technique a few days before you did, and I quickly ran into issues feeling too limited with what I could have. So I just decided to basically boost the power foods as much as possible, but not really count the extras (instead just really being mindful when I go for a non-power food). I think it's actually been working pretty well for me! I've managed to have treats but I'm actually less likely to go overboard than when I was counting. I've gone back and forth on this but I think the fact that it's such a busy time of year means that this is what I need to do right now. If I only maintain right now that is just fine, and bonus if I lose weight! I have a Wii U so I looked for this game online but Amazon says it doesn't come out until the end of 2014? Too bad it's such a long wait! Is there a difference between Wii Fit And Wii Fit U? Yes, there are additional games and exercises, and also the ability to use the Wii Fit Meter. In my opinion, if you already have a Wii U, it's totally worth buying the Fit Meter (which includes the Wii Fit U game) for $20. But if the only thing you do on the Wii is the Wii Fit, then I don't think it'd be worth buying a Wii U console just for that purpose. Glad I read this today; I had just finished writing a message in a card but hadn't filled out the mailing address yet. Good Luck with you Wii U challenge.